-Taught private lessons from home and at students homes on and off in between time spent at college. -Lessons focused on the fundamentals of guitar as well has improvisation and basic music theory. I find it important to conduct lessons that keep students interested in the aspects of music that they enjoy while offering information and material that challenges them to think about music/guitar in new ways. I find it very important to keep students engaged throughout the entirety of the lesson and to assign material that will generate a desire within the student to practice throughout the week. I believe that a good teacher must demonstrate patience and understanding toward their students since these traits will ultimately play a huge role in encouraging students to continue with the program. 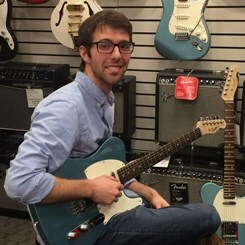 Request Lessons with Derek McNamara today!